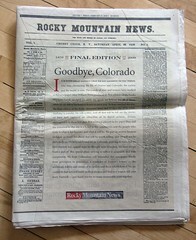 When I heard the announcement that Denver’s Rocky Mountain News was shutting down, I hopped on my cell phone while riding in a car across New Jersey to ask a friend of mine in the real estate business to pick up a copy for me. While leaving a voicemail, the GPS in my rental car was politely recalculating our route after my co-traveler missed an exit ramp. To me, this marked a significant tipping point for the real estate industry in Colorado: no longer would real estate agents and brokers have the option to advertise in that newspaper. This is one of the healthiest things that could happen to the real estate industry. Why? Because today’s home buyers and sellers have turned to the Internet for real estate information. Taking away the option to advertise in the newspaper forces people in the real estate business to reevaluate how they are going to reach prospective clients. For decades, newspapers, real estate agents and brokers lived in a mutually beneficial relationship. Newspapers provided access to a real estate business’ prospective buyers through large (at times, heavy) classified sections. This was the place to find out about what was new on the market. In fact, it wasn’t that long ago that I would buy a Sunday newspaper specifically for the classified ads. In this media dependent era, real estate companies relied upon ads in their local newspapers to reach prospective clients. The media dependent era existed for decades with all of its weaknesses: real estate advertisers had no choice but to spend big dollars on minuscule ads that told prospective buyers very little about for sale homes. The listings couldn’t be sorted, filtered, mapped, or emailed, and there was very little there to compare. Consumers had a hard time determining which properties were worth taking time out of their busy schedules to visit. Agents drove buyers all over town to show them what newspapers could not. As the world wide web began to grow it became apparent that it was a game changer. Real estate companies could now publish much more information about every single for sale property in their market including multiple color photos. Consumers quickly flocked to the web to gain access to information that newspapers were not capable of providing. While consumers were quick to move to the web, many real estate firms were slow to follow, giving opportunities for many web based real estate start-ups to beat organized real estate companies to their customers. Lead generation firms got rich selling leads back to the slow movers. This era is now winding down as real estate brokers and agents have begun to catch up. The real estate consumer in 2009 is a savvy Internet user. They are connected to the web from work, at home, and in many cases, on their phone. The web is, in most cases, the first place they go to look for real estate information. But more importantly, it’s the place nearly every home buyer and seller ends up when researching homes, figuring out how much to offer, who they should work with on their transactions, and how to navigate the home buying or selling process. Today’s consumer, whether they’re researching a movie to go see, a medical condition, or which agent to work with, turns to the web before picking up the phone or leaving their home. Consumers used to gain knowledge from a combination of their local paper’s real estate section and classified ads. Today, they turn to the web. Winning real estate businesses have discovered that rather than being media dependent, they can become the media. Consumers flock to websites that give them the information they’re looking for; from professionally presented property information, to analysis of local real estate markets, to extensive bios of agents that help them figure out who they should trust to guide them through their next real estate transaction. Whomever becomes the go-to source for real estate information in your market wins.